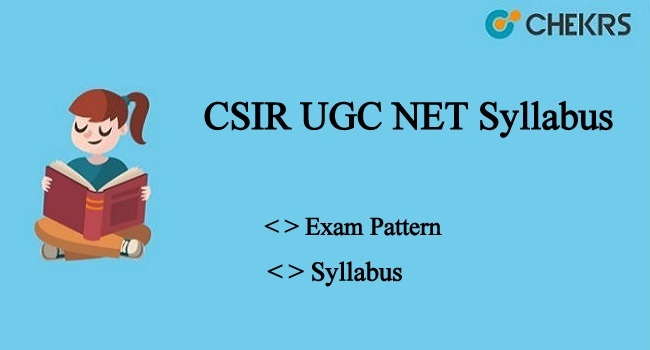 CSIR UGC NET Syllabus 2019: The CSIR In collaboration with UGC has released a latest CSIR NET 2019 Notification June regarding the vacancies of the JRF and Lectures in its department. The eligible candidates have to give NET (National Eligibility Test) in order to qualify for the vacancies. The interested candidates had to register themselves for appearing in the exams. The candidates are informed that the date for the exam has already been made available by the department which will be conducted on 16th June 2019. Latest Update: CSIR is going to conduct the UGC NET 2019 on 16th June 2019. Applied candidates can check the exam syllabus and CSIR UGC NET Exam Pattern from here. The candidates would require strong preparation in order to crack the exam. Here in the article below, we have mentioned the CSIR UGC NET Syllabus 2019 Mathematics and exam pattern for the candidates looking aids to prepare for the UGC NET CSIR Exam 2019. To help all the participants of the competitive exam conducted by UGC for JRF and Lecturer post syllabus has been provided now. The candidates who want to make sure that their exam preparations go in the right direction are advised to go through the CSIR NET Syllabus 2019 Physical Science Pdf. The syllabus is the crucial part for all the candidates to start their preparation. Hence we have mentioned steps to download the CSIR NET Exam Syllabus 2019 without any inconvenience. Further to open the pdf of the subject-specific syllabus click on the subject name. To download the pdf click on the download button available in the right. The CSIR Exam Pattern 2019 Chemical Science is very crucial to give you a brief idea of the actual exam paper. The exam is distributed in Paper 1 and Paper 2. The below-mentioned table will help all the candidates to form strategies for appearing in the exam. There will be two sessions in the exam and both will be MCQ based. The exam will be divided into 3 parts Part A, B, and C. All the different part will have different marks and questions varying on the subject. Session 1 will be a general paper while session 2 will be the specific one. The CSIR National Eligibility Test (NET) on behalf of the University Grants Commission (UGC) exam will be conducted on 16th June 2019. The Exam will be conducted for the 5 subjects and each subject will consist of three Parts. Here we have shared the Joint CSIR NET Exam Syllabus Pdf Link for exam preparation. Visit our website which is www.jobs.chekrs.com for more details. If you face any query while exam preparation you can ask us anytime, our Chekrs team will reply to you shortly.